"Conditions have deteriorated rapidly," he told parliament. "Take care and stay safe. Be prepared to shelter in place until Wednesday." He said the Australian government would be urging insurance companies to be "compassionate" and supportive of people who have claims to make following the cyclone. The extent of Cyclone Debbie's devastation, which has a 50km-diameter eye wall, may not be known for some time, the authorities said. Queensland Police Commissioner Ian Stewart said the storm's slow speed had created a "battering ram effect", adding: "We are going to get lots of reports of damage, and sadly I think we will also receive reports of injuries, if not death." "Everyone is going to be in shock tomorrow, just to see the full impact of this cyclone," she said. "I'm bracing myself for it." "We're going to see the impact of Cyclone Debbie for the next three to five days," Ms Palaszczuk said. She also condemned those people spotted surfing during the cyclone as "irresponsible" and "ridiculous". More than 25,000 people were urged to evacuate their homes ahead of predictions the cyclone would be Queensland's most damaging since 2011. One person in the Whitsunday Islands compared the winds to "freight trains coming through left and right". "The trees are going wild," the man, identified only as Charlie, told the Australian Broadcasting Corp. "The place is just shaking continuously." 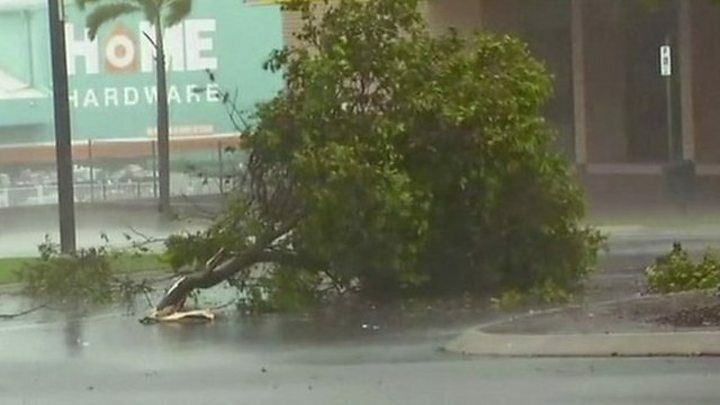 Greg Williamson, the mayor of Mackay regional council, told the BBC: "We've had winds up to about 95km/h for the last 12 hours. We've had torrential rain.... but that's what you get for living in a tropical paradise." He said the Whitsunday Islands, Proserpine and Bowen were "really getting lashed now at the moment". The Insurance Council of Australia declared the cyclone a "catastrophe"
It made landfall at close to its peak intensity, Dr Jeffrey D Kepert, head of the Bureau of Meteorology's High Impact Weather Research told the BBC. Crucially, it is also very slow-moving. That "can be more damaging because the duration of strong winds is longer. As structures experience a longer battering, things like metal fatigue set in, leading to more damage. Also, more of the rain falls in the same area rather than being spread out, leading to a greater flood risk". Fortunately Debbie looks likely to head between two cities so "the destruction is likely to be somewhat less than feared". And while tourists are less able to evacuate from the resorts that have been hit more directly, their hotels are "likely to have higher foundations" and be built more solidly than many ordinary homes near the coast. No. The storm will still be around even as it downgrades but, as a silver lining, it could bring some relief to farmers affected by drought. "Hopefully that will bring a bit of rain to the interior," Professor King says.